Search Results for "tiki torch"
Tiki torches burning at beach. Illuminated torches are at seaside against sky. Beautiful view of sea at sunset. Burning Tiki torches at beach. Torches are illuminated at seaside against sky. Beautiful view of sea at dusk. A tiki torch lights up the evening at an outdoor event near a pond. A tiki torch lights up the evening at an outdoor event with a white tent canopy. A tiki torch lights up the evening at an outdoor event next to a building. This is a 4K clip of a Tiki torch shimmering in the evening with a red sunset and trees in the background. Tiki torch filmed on a Sony a7sii at 120fps exported at 23.98fps. Stabilized with Glidecam HD-2000. A sunlit cedar plank fence on a breezy spring afternoon. Old stumps and tiki torches visible. 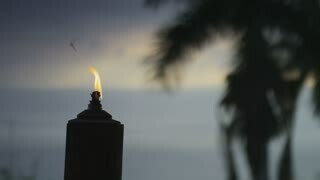 Macro shot of tiki torch flame at the seaside with copyspace from right.